The coast of Southwest Florida is covered in beautiful islands, literally thousands, if not tens of thousands. Of these, only a handful are large enough to be inhabitable by people, and not surprisingly, the real estate at these locations is highly sought after. If you’ve always dreamed of settling down on an island surrounded by blue, especially one in gorgeous and sunny Southwest Florida, put these four major islands at the very top of your list. Of the major Southwest Florida islands, Marco Island is the furthest south and is considered part of the Ten Thousand Islands. Marco Island, however, is perhaps lesser known than some of the other Southwest Florida islands, but remains a popular tourist attraction and vacation hotspot, though for more an older generation or family-oriented crowd. The island has great dining and shopping, and contains much of the same elegance and classic atmosphere as that of nearby Naples on the mainland. Real estate is luxurious and timeless, and a large portion of it is waterfront, with easy access to the Gulf of Mexico and nearby canals. Fort Myers Beach is actually a small town located on Estero Island, but most will know the area simply as Fort Myers Beach. The island is small, with a population of just around 7,000, but is well known, not surprisingly, for its beautiful beaches. Unlike some of the other islands in the area, Fort Myers Beach tends to have a younger range of residents, and the nightlife on the island is some of the best in all of Florida. With plenty of fun restaurants and bars to choose from, as well as great shopping and an abundance of daytime beach activities available any day of the week, you’re right in the center of Southwest Florida entertainment on this island. Since Sanibel and Captiva used to be joined into a single island, they are often still grouped together when talked about, and have very similar appearances and atmospheres. Both islands are known for having some of the finest beaches and shelling in the entire world, as well as the most sought after real estate, and it’s no surprise the communities on these islands remain small and exclusive to this day. A home on one of these islands will certainly match the fantasy of white sand and pristine water, but prospective residents should consider the added cost of tolls for going to and from the island – even for permanent residents. 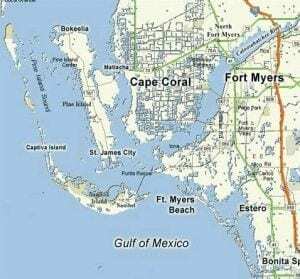 Pine Island, which is located just west off the coast of Cape Coral and is the largest island in the state of Florida, is unlike any of the other islands that can be found here. Where other Southwest Florida islands have soft white sand beaches in abundance, Pine Island has no major beaches and is made up mostly of coral rock. That’s not to say that Pine Island is lacking, however, in beauty or charm. It is often described as “old Florida” and a fishing village. Pine Island is zoned for agricultural land and many are attracted to its unique and rural nature. Many Pine Islanders are palm free farmers, landscape nursery owners, and commercial fisherman. The island is comprised of four unincorporated towns, and despite its seasonal attraction, maintains a small town and close knit community feel. To learn more about Southwest Florida island living or to explore Pine Island, Marco Island, Sanibel/Captiva, or Fort Myers Beach real estate for yourself, contact Dave and Brenda of Sage Realtor Group today by calling (239) 896-8549.